Like I may have mentioned before, the holidays kind of irk me. I am forever resisting the forced good cheer and ubiquitous holiday decorations -- it’s all just way too much. So for those of you who agree, how about this year we forget the traditional pine tree and instead surprise the fam by bringing home this wild ETree floor lamp designed by Jesus Felipe and Sylvia Grimaldi of the UK? 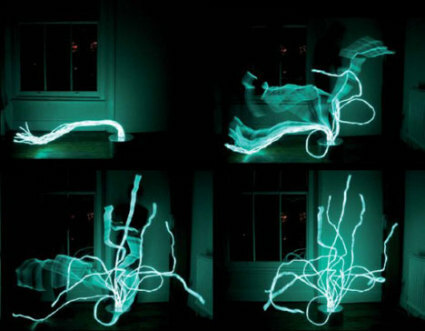 This ten-limbed, interactive tree-lamp beast uses flexible electroluminescent tubes to produce myriad of sculptural effects, limited only by your imagination and space. For the traditionalists out there, you could always shape it into the outline of a "normal" Christmas tree and hang some ornaments on it, and then bask in its blue glow. Or, for a better time, you could mummify your children or pets and see if they can escape its bendable branches! Holiday fun, indeed! ETree Lamp literally bends to your every whim: You can make this flexible light sculpture as small as 30x30x30 cm high, or as large as 300x300x170, depending on your personal inclinations. A large ETree floor lamp will set you back about £1000 (roughly $2000), while a mini, five-branched table-top version runs £360 (about $750 USD). And just think – you can play with this interactive tree long after the holidays are over! Score one from Kinetica Design Museum .